(AFP) Iraqi forces launched an offensive on jihadists defending Mosul’s west bank Sunday, in what could be the most brutal fighting yet in a four-month-old operation on the city. “Our forces are beginning the liberation of the citizens from the terror of Daesh,” Iraqi Prime Minister Haider al-Abadi said in a short televised speech, using an Arabic acronym for the Islamic State group. “We announce the start of a new phase in the operation. We are coming, Nineveh, to liberate the western side of Mosul,” he said, referring to the province of which Mosul is the capital. 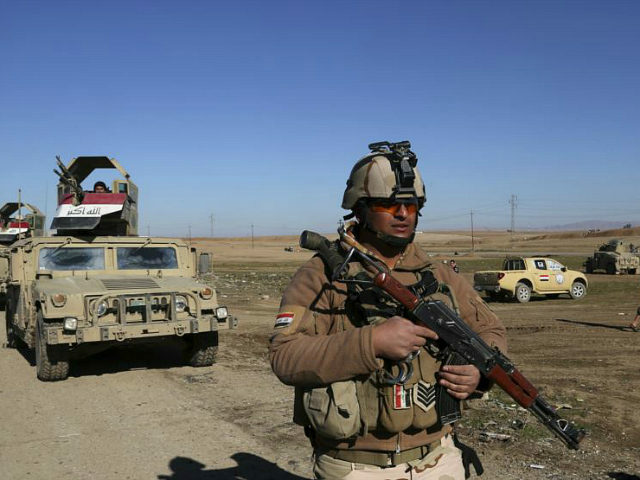 Federal police and interior ministry forces were expected to start the new phase in the offensive by moving on Mosul airport, which is on the southern edge of the city, west of the Tigris River. The jihadists have put up stiff resistance to defend Mosul, their last major stronghold in Iraq and the place where their leader Abu Bakr al-Baghdadi proclaimed a “caliphate” in 2014. After shaping operations around Mosul, it took Iraq’s most seasoned forces—the elite Counter-Terrorism Service (CTS) — more than two months to clear the eastern side of Mosul. Prior to the offensive that saw IS seize Mosul and much of Iraq’s Sunni Arab heartland nearly three years ago, the east bank was more ethnically diverse than the west, where analysts believe the jihadists could enjoy more support. While the federal forces’ attrition is said to be high, IS’s had been undoubtedly higher and commanders have said the jihadists may no longer have the resources to defend east Mosul effectively. Recent incidents in liberated east point to the difficulty of ensuring remnants of IS have not blended in with the civilian population in a huge city which most residents did not flee ahead of the government offensive. Aid organisations had feared an exodus of unprecedented proportions before the start of the Mosul operation but half a million—a significant majority—of residents stayed home. Their continued presence prevented both sides from resorting to deadlier weaponry, which may have slowed down the battle but averted a potentially much more serious humanitarian emergency in the middle of winter as well as more extensive material damage to the city. “Mosul is going better than we expected, but there are serious dangers ahead,” Lise Grande, UN humanitarian coordinator in Iraq, told AFP. Residents of west Mosul have reported very difficult living conditions and warned that they were already low on food, with weeks of fighting expected to lie ahead. IS fighters and Mosul residents remained able to move across both sides of the city during much of the fighting in the east but all bridges across the Tigris have now been dropped and the jihadists in the west are all but besieged. IS has used civilians as human shields as part of its defence tactics and killed residents attempting to flee, making it both difficult and dangerous for the population to escape. While specialised units may attempt to throw pontoon bridges across the river to attack from the east, the main initial assault of the upcoming phase in the Mosul is expected to come from the south on the city’s airport. Army, police, interior ministry and special forces have been gearing up for the push on Mosul’s southern front, with a large concentration of fighters based out of Hammam al-Alil.